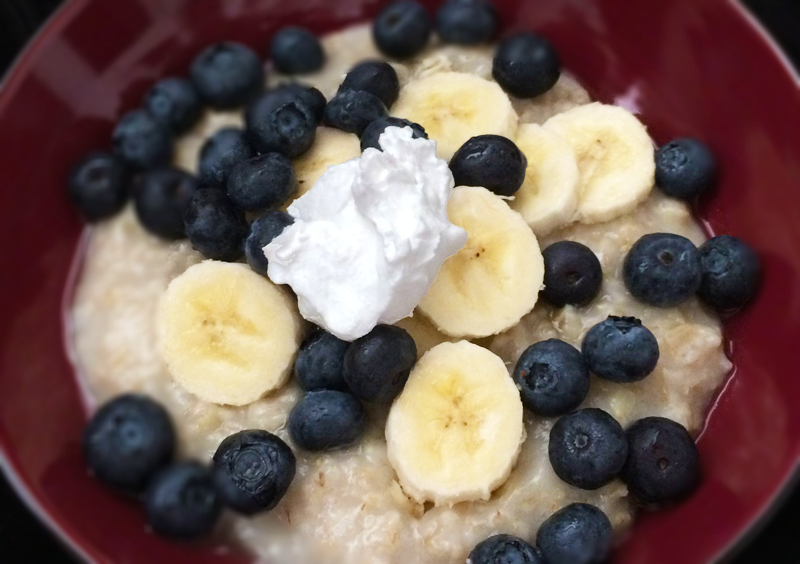 “Oatmeal’s most enduring claim to fame is its proven ability to curb bad (LDL) cholesterol. Chalk that up to a type of soluble fiber called beta glucan. Eating oats is linked to an average 7% drop in LDL cholesterol, research shows. Many other things also affect your heart’s health (like what else you eat, how active you are, and whether you smoke), but oatmeal is a simple heart-smart start. I’ve become a serious fan since I found out about the everlasting health benefits of oatmeal. I like it with a teaspoon of minced ginger, some cinnamon, bananas, blueberries and a scoop of coconut cream. This entry was posted in Breakfast, Fibromyalgia, Gluten Free, Health, Life, Uncategorized and tagged Banana, Blueberry, Breakfast, cholesterol, Cinnamon, Coconut Cream, LDL cholesterol, Oatmeal, soluble fiber. Bookmark the permalink.